These are so easy and so cute. My three year old had a great time doing these. 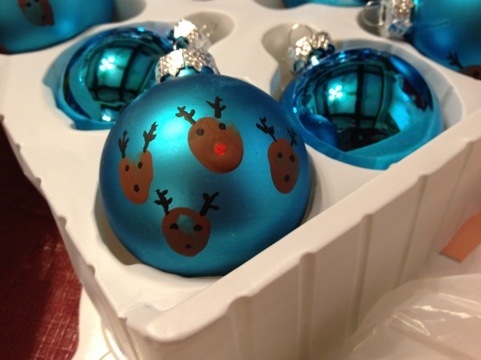 All you need are glass ball ornaments and acrylic paint. I let my son choose if he wanted to do each finger or one finger multiple times. He chose his pointer finger (excellent choice). He dipped his finger in brown paint. I held the ornament and guided his hand as he left his finger prints. I used the packaging the ornaments came in as a drying rack. Then I just added the little eyes, noses and antlers with black paint, except of course for Rudolph’s red nose. 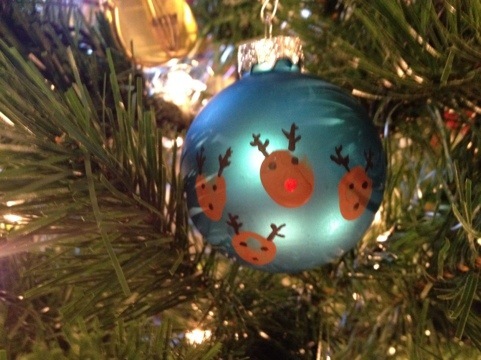 Each ornament got one Rudolph. I also wrote his name and the year on the back of each one of these. To keep my wiggly three year old busy while I painted in the details on both his and his brothers ornaments I gave him some kid friendly paints and let him go to town on plates, paper, and even the leftover glass ornaments. He loved that we were painting together and it gave me enough time to get the project done.